JESSUP, MD, May 6, 2015– Bob’s BMW Motorcycles in Jessup will host a Military Appreciation Day this Saturday, May 9 to honor local veterans and introduce the community to VETMotorsports, a 501(3)(c) charity that honors and empowers injured warfighters through active participation in motorsports. The event, which will run from 9:00 AM to 4:00 PM at the Guilford Road dealership, is open to the public and will showcase unique military motorcycles dating back as far as WWI and WWII, as well as a modern-day 2008 BMW R1200GS that “tells the story of an American fighter pilot.” In addition to enjoying food and beverages, attendees will have the chance to meet representatives from VETMotorsports and Absolute Cycle Experience and enter to win prizes, including two Absolute Cycle Experience track-day passes courtesy of Brian Conrad of Edward Jones Financial. Founded in 2012, VETMotorsports is an award-winning, non-clinical outreach program that provides inspiration and motivation to combat-wounded, post-9/11 warfighters by making them part of a new team and giving them a new mission. The program recruits participants, embeds them with professional race teams and covers all expenses for them and a caregiver to take part in the experience. One of the ways VETMotorsports is raising money for the cause is by inviting local riders and motorcycle enthusiasts to participate in an upcoming track-day fundraiser hosted by Absolute Cycle Experience. The track day will take place on Tuesday, June 9 at New Jersey Motorsports Park with proceeds going to VETMotorsports. Representatives from Absolute Cycle Experience also will offer mini track-day seminars at 10:00 AM and 2:00 PM during the Military Appreciation Day event, speaking with guests about the value of track days for riders of all types, as well as proper preparations, expectations and common misperceptions. They also will be available throughout the event to answer questions. For more information about the event, contact Hanna Creekmore at hanna@bobsbmw.com or (301) 497-8949. 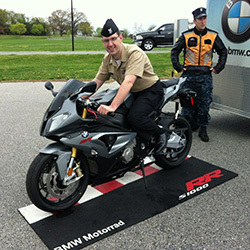 You can also visit www.bobsbmw.com,www.vetmotorsports.com, or www.absolutecycle.com to learn more.